Columbus, Ga., Phenix City, Ala., and Grand Rapids, Mich., restoration projects strive to revitalize urban centers with river-based recreational centers. Urban river restoration – the process of using already existing resources to improve local ecologies and economiesis – is a growing trend in waterfront cities. Cities such as Columbus, Ga., and Phenix City, Ala., have seen benefits from such projects, and Grand Rapids, Mich., recently announced its $2.7 million plan to restore rapids to the Grand River. The namesake rapids of Grand Rapids gradually disappeared during the mid-19th century, according to a report in the Aspen Daily News, due to to two human means of interference: riverbed quarrying and the cutting of canals to provide power. Similar to problems in Columbus, Ga., and Phenix City, Ala., the Grand River flowing through Grand Rapids provided few economic or recreational benefits to residents. But plans have been drafted to change that. As part of the “Green Grand Rapids” effort, the river restoration project aims to reshape the physical structure of the river and its banks and repair the natural habitats of various aquatic species including sturgeons, mussels, steelheads and salmon. 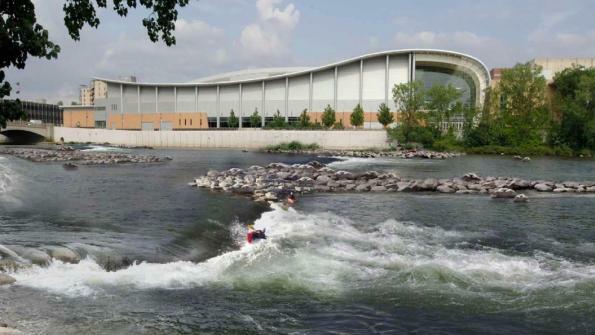 Grand Rapids Whitewater, a non-profit organization, in partnership with RiverRestoration, a Colorado-based river design and engineering firm, plans to remove five dams, add recreational enhancements and improve fisheries and the general aesthetic of the river, according to project materials. Recognized by the White House Council on Environmental Quality, the Grand Rapids project is one of 11 newly selected additions to the Urban Federal Waters Partnership. Designed to revitalize urban communities, particularly those under economic stress, the partnership includes 13 federal agencies working to support community river restoration efforts with federal funding. “This project is a great example of a successful public-private partnership,” Jason Carey, principal river engineer and president of RiverRestoration, said in a statement. “Working together with local, state and federal agencies, the revitalization of the Grand River through the city will have significant economic, environment and social benefits.” The effort is projected to be completed in two to three years. Other cities expecting to see benefits from a similar project are Columbus, Ga., and Phenix City, Ala. Proposed 15 years ago, sister cites Columbus and Phenix City sought to enhance social and economic aspects of downtown areas by adding to the communities’ recreational bases, specifically through rafting and kayaking tourism, according to project materials. Opened in May 2013, Whitewater Columbus, a 2.5-mile urban rafting course, is already drawing out of town adventurers. Costing $2.44 million, the project was funded mainly through private donations and a $600,000 grant from the National Oceanic and Atmospheric Administration’s Open Rivers Initiative, according to GBP TV and the Ledger Enquirer. Additional monies came from the Columbus and the Army Corps of Engineers. The economic benefits of the project are expected to take time, according to GBP, but Whitewater Columbus is estimated to create 700 jobs and have an economic impact of $42 million per year.